To be committed to the production of world class graduates grounded in value-and-income generating skills for self-sustenance and socio-economic development of nations, by leveraging on our core competencies in research, teaching, and community service. 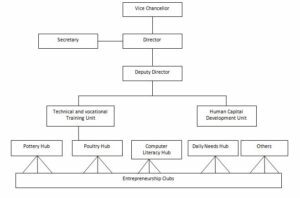 Entrepreneurship education: To comply with National Universities Commission (NUC)’s educational policy directives by ensuring that all undergraduate and post graduate students in all disciplines of learning acquire entrepreneurship development skills (theory and practical) during their study period. Entrepreneurship research: To comply with NUC’s educational policy directive by ensuring that the Centre support and publish innovation-centred scholarly research in humanities and sciences. Protection of Intellectual property: To comply with NUC’s educational policy directives of ensuring that students, staff, IBBU, and partners’ innovative products are patented to minimize/eliminate property theft of all kinds and guarantee maximum returns on investment. Community Development: Developing the capacity of business community (practicing and potential entrepreneurs) to produce innovative products that stimulate market demand, sales and business expansion for more job vacancies/opportunities. This programme is designed to complement the General Studies Directorate’s effort in teaching “GST 202-Introduction to entrepreneurial Skills” (theory) and “GST 301- Entrepreneurial Skills II” (theory and practical). The programme is aimed at ensuring that students acquire vocational, practical and technical skills in any preferred area of business using the personnel, material and machines in Centre. This programme is compulsory for undergraduate students in 300-Level. The aim is to allow students choose any entrepreneurial clubs of their interest while the Centre creates platforms for learning and monitoring progress. Trainers in the entrepreneurial clubs are supposed to be student-entrepreneurs who have been certified and have excelled in certain hands-on occupation. The idea is that student trainees learn faster when taught by co-student trainers. The target of this programme are final year students who may want to establish entrepreneurial ventures or start-ups upon graduation but may be faced with financing challenges. Therefore, the aim of this public lecture is to enlighten students on funding opportunities in government banks (CBN, BOI, and NEXIM), commercial banks, and foundations, and on how to qualify for such funds usually through research-based business and financial plans. Resource persons will be drawn from the government banks and operating business establishments that have accessed the institutional funds in the past. The programme shall take place in the First Semester of every session (e.g. in January/February). The targets of this programme are 300-level students who need to perfect their entrepreneurial vocational skills. The aim is to acquaint students with new and improved skills of production and operation in selected vocational works. Resource persons shall be successful industrial captains. This programme is billed to take place in second-semester of every academic session. Entrepreneurship is meant to be a lifetime occupation, but the question for the beginners is ‘which form of business or occupation?’ Thus, this workshop is aimed at helping newly admitted UTME and DE students discover their talents and interests as the basis for carrier-choice in entrepreneurship. Here, professional counselors will be engaged as facilitators. This programme is billed to take place in second-semester of every academic session. Excursion to industrial parks, SME clusters, and technology incubation Centres in Nigeria shall be organized by the Centre on annual basis. Therefore, students shall be dully informed about our annual field-trips and financial arrangements made based on the distance of the place of visitation. The programme shall be funded by the participating students. The Centre shall organize ‘Creativity Excellence Award’ to honour students who distinguish themselves in any of the existing entrepreneurship development programmes in the University. This programme shall be funded by the Centre. A healthy and happy retirement life is function of physical and income-generating activities. Thus, this programme is designed to equip IBBU-staff’s capacity on specialized vocational and technical skills of their interest. This programme is designed to update knowledge and skills of employees working with the private and public sector of the economy. The current knowledge economy where new methods of production and operation emerge almost on daily basis as made staff capacity building quintessential to the delight of the employers and customers. The programme shall be self-funded. The Centre shall reach out to Women Cooperative Societies, Farmers Cooperatives Societies, Youth-Development Cooperative Societies, Sport clubs, and trade associations for entrepreneurial skill development purposes. Poultry: Chicken, egg, meat, chicken feed, etc.